Later this year, Gecco will be releasing their next Dark Souls statue. Unlike previous ones, which have featured characters from the series (and run up $300 price tags), this one is just the bonfire. 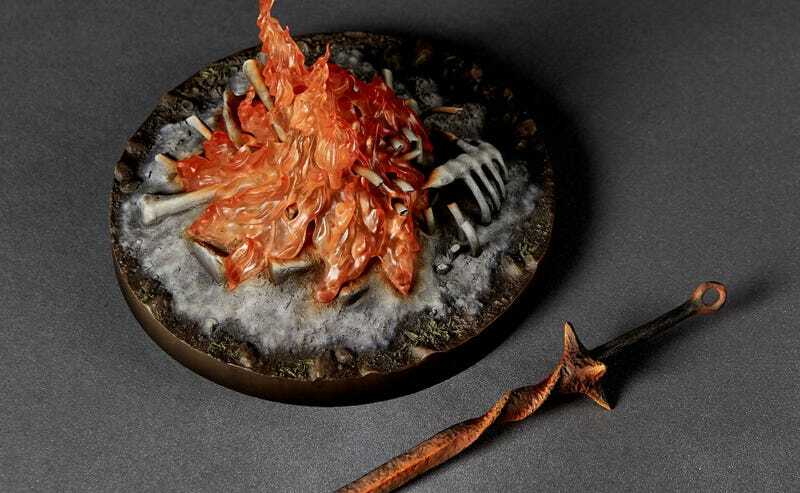 The bonfire is 1/6 scale, same as the statues, and does actually have some functionality; the sword comes separate from the base, and when you insert it the fire will start glowing and flickering with LED lighting. It’s intended as an accessory to Gecco’s other pieces, something you’d pose them around, but I kinda like it on its own. A little punch clock for the work-from-home crowd. Sit down, log on, insert the sword, save your progress, die repeatedly, log off. Repeat five times a week.